I’m one of many people who can’t resist the sight of melted cheese over something; for me, cheese makes everything more delicious that’s why I love pasta and pizza so much because of the cheese! 🙂 For a meat lover, cheese-person like me out there, this is a must-try recipe. 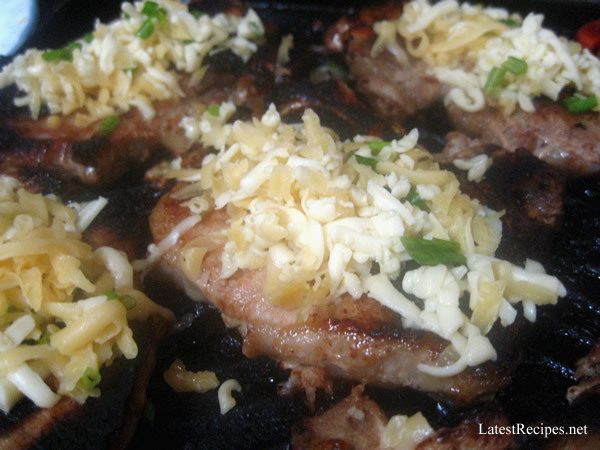 This grilled pork steak with melted cheese on top is crazy-delicious! Place pork steak in a heavy duty ziplock bag; set aside. Combine beer, garlic, olive oil, honey, salt and pepper in a small bowl, mix well and pour over pork in the bag. Seal bag and let pork marinate for at least 4 hous up to 24 hours in the refrigerator, turning bag occasionally. 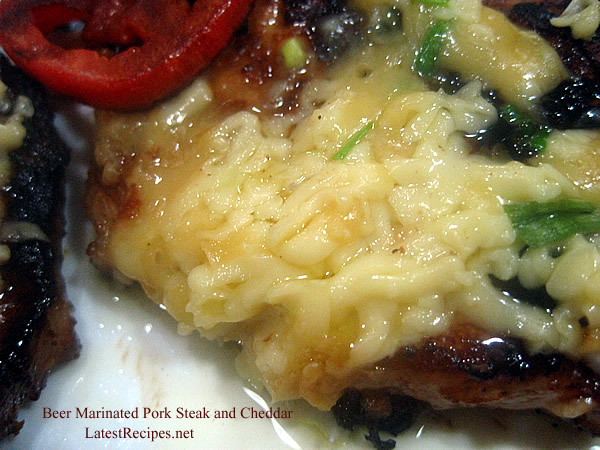 Drain pork chops, discarding marinade, when ready to cook. Preheat grill. Place pork on rack and cover. Meanwhile for topping, combine cheese, green onions and nuts in a small bowl. Spoon mixture over pork. Cover and grill 2-3 minutes more or until cheese is melted. One Response to "Beer Marinated Pork Steak and Cheddar"
My family doesn’t stray far from Shake n’ Bake, so I tend to not really like pork so much. I need to find more interesting recipes to try out on them, like this!